Make 2019 the year you have the best credit card for your spending habits in your pocket. Whether you're looking for a lengthy intro 0 percent APR period, in order to rack up cash-back rewards on your everyday purchases or aspiring to cash in miles for that dream vacation, CardRatings editors have identified the card for you. We've narrowed the field of available credit cards down to the top credit cards of 2019 in a variety of categories that address specific needs. Finding the right card can be a tall order, but this annual list should simplify the process. Each year, CardRatings editors comb through hundreds of credit card offers and anoint our favorites with an Editor's Choice award. We know that the average consumer doesn't have the time to sort through all the details of each credit card offer, so we do it for you. Whether you're on the hunt for a balance transfer card to help you manage paying-off debt or you want to make this the year that you put cash-back rewards toward a special purchase, we have you covered. In this slideshow you'll find some of our most popular categories, but if you're looking for something more specific, be sure to check out our full "Best Credit Cards of 2019" list. Earning cash back on your purchases is a very attractive feature and there are lots of reward structures to help you do that. The flat-rate cash-back card is the simplest with its single earn rate across all categories, every day. *Check out our full "Best of 2019 list" for our picks for tiered and rotating categories cash-back cards. (Citi is a CardRatings advertiser) This flat-rate cash-back card offers you 1 percent back when you use your card to make your purchase and then another 1 percent when you pay for the purchase by paying your credit card statement. That effectively means you earn 2 percent back on all your purchases and that makes the Citi® Double Cash Card - 18 month BT offer among the highest earning flat-rate cards on the market. There's no annual fee for this card and you can also take advantage of 18 months of zero interest on balance transfers (then, 15.74% - 25.74%* Variable). Editor's Note: This article is kept accurate as of the date it was written in order to correctly reflect award winning offers. Some of the offers in this article might have expired. Please check our database for the latest terms and conditions. A reasonable annual fee can enable you to access top-of-the-line travel rewards, so if you travel even a few times a year, our pick for best travel rewards credit card may pay off well for you. *For our top travel rewards credit card without an annual fee, as well as cards specifically for airline and hotel rewards, check out our full "Best of 2019" list." We love how easy to use and flexible Chase Ultimate Rewards® points are. Those points can be transferred to a number of airline and hotel partners at a 1:1 rate and they're worth 25 percent more when you redeem them for travel directly through Chase. That redemption bonus means that the 60,000-point signup bonus (earned after spending $4,000 on your card within the first three months) is actually worth $750 in travel. Keep the earning going with two points per $1 on dining and travel purchases and one point $1 on all your other purchases. When it comes to travel rewards flexibility, it’s hard to beat the Capital One® Venture® Rewards Credit Card. You earn two miles per $1 on every purchase and, on top of that, you can earn a 50,000-mile bonus after spending $3,000 within the first three months of account opening–that’s worth $500 in travel. That intro bonus alone should more than make up for the $0 intro for first year; $95 after that annual fee. When it comes to redeeming your rewards, you can fly any airline, stay at any hotel, anytime and not have to worry about blackout dates. Plus you can transfer your miles to over 12 leading travel loyalty programs – which is another plus for this easy-to-carry card. Editor’s Note: This article is kept accurate as of the date it was written in order to correctly reflect award winning offers. Some of the offers in this article might have expired. Please check our database for the latest terms and conditions. Balance transfer credit cards can help you pay down balances quickly thanks to the zero-interest periods–often from 12-18 months. During that period, every penny of each payment goes toward reducing the principal owed on your balance. Here are our picks for top balance transfer credit cards. There are a number of cards that offer introductory balance transfer periods, but there are very few that offer you that zero-interest period along with no balance transfer fee. Amex EveryDay® is one of those cards that has excellent ongoing rewards that should benefit you long after you pay off your balance transfer amount. You can take advantage of an introductory 15 billing cycles of zero interest on balance transfers AND purchases (then, a variable APR of 14.99% to 25.99%), and you won't pay a balance transfer fee for transfers made within the first 60 days (after that period, you'll pay a 5 percent fee with a $5 minimum) (Terms apply. See Rates and Fees). You can take advantage of this excellent offer without paying an annual fee. If you need longer than 15 months to pay off a balance, you might consider Citi Simplicity® Card - No Late Fees Ever, which offers an introductory 21 months (from date of first transfer; all transfers must be made within the first four months) interest-free on balance transfers and 12 months of zero interest on purchases (then, 16.24% - 26.24%* Variable). Trying to consolidate debt? Need time to pay off a big purchase? You will pay a $5 or 5% percent balance transfer fee, whichever is greater, but you still stand to save some money if that transfer means not paying higher interest for the months you need to pay off the balance. Cardholders benefit from no late fees, no penalty rate and no annual fee – ever. Small business owners, entrepreneurs and freelancers can benefit from small business credit cards, but your bottom line may not be in a position to handle an annual fee for that card. Good thing there are some great options for no-annual-fee business cards that still meet the needs of many business owners. *Sometimes a very small annual fee can mean a big jump in rewards and perks. If your business can support an annual fee, check out our pick for Best Small Business Credit Card in our full "Best of 2018" list. We like a card that offers excellent benefits for a modest annual fee, perks include cell phone insurance for the primary phone number as well as employee phones on the same account. Cardholders earn 3 points per $1 on the first $150,000 spent in combined purchases on travel, shipping purchases, Internet, cable and phone services, advertising purchases made with social media sites and search engines each account anniversary year. Also get 1 point per $1 on all other purchases-with no limit to the amount you can earn. This card can be a great fit for those who don't travel often for business. There's no annual fee and the solid bonus categories can benefit just about any business owner. For example: Earn 5 percent cash back at U.S. office supply stores and on wireless telephone services purchased directly from U.S. service providers, 3 percent on the category of your choice from a list of eight and 1 percent cash back on other purchases. Plus, there's no annual fee to worry about offsetting (Terms apply; See Rates and Fees). Sometimes you just need a little extra time to pay off a large purchase or perhaps you’re looking for a way to pay less on a balance you already have. Zero percent introductory APR credit cards can be excellent options for you. This card offers an introductory 0 percent period of 15 months (then, 14.24%, 20.24% or 25.24% Variable), and comes with a couple of additional features that helped it top our list. Namely, HSBC cardholders can rest easy if they accidentally miss a payment: there is no penalty APR and you can miss one payment a year without incurring a late fee. There are also no foreign transaction fees, which can be a big advantage if you travel internationally (Terms apply. See Rates and Fees). Enjoy an introductory 18 months of zero interest on purchases and balance transfers (then, 17.74%-27.24% Variable). Cardholders receive cellular telephone protection if you pay your mobile bill on the card, and the card allows you to pay off a large balance interest-free over time, a potentially valuable reward. Plus, you get easy access to your FICO® Credit Score with Wells Fargo Online® and there's no annual fee. There is a balance transfer fee of 3% for 120 days, then 5%. 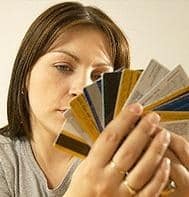 Sure a nice introductory APR offer is great if you already have a balance you're trying to pay down or know you'll be making a big purchase in the near future, but an ongoing low-interest credit card is the one you may want to reach for when an unexpected major purchase comes your way. Take a look at our top pick. With an exceptionally low variable APR, the Simmons Visa® is one that could save a lot of money if you have an unexpected purchase come up and no 0-interest introductory offer available to you. What's more, if you already have a balance on another card, you can transfer that balance to this card – and take advantage of that low APR – without paying a balance transfer fee, which is typically 3-5 percent with other cards. It's also nice that this card has no annual fee! Another low ongoing interest option is the Barclaycard Ring® Mastercard® (See Rates and Fees). It features no interest for 15 months on balance transfers made within the first 45 days of account opening, then 14.24% Variable. As with the card above, you won't pay an annual fee to carry this card, and there are no foreign transaction fees which helps when you travel internationally. Sometimes you just need some time and an opportunity to build or rebuild your credit. While the top-tier credit cards aren't available to you, there are solid credit card options that if used responsibly could help you take a major step forward in improving your credit score and, down the road, qualifying for credit cards with flashier perks and features. It's a rare secured card that offers the opportunity to earn cash back, but Discover it® Secured gives you that perk. You'll establish your line of credit with a security deposit of at least $200, but there's no annual fee beyond that. Then, you'll earn 2 percent back on the first $1,000 you spend each quarter at restaurants and gas stations and 1 percent back on your other purchases. Another no annual fee option is the Capital One® Secured Mastercard®, which requires a security deposit of $49, $99 or $200, depending on creditworthiness, to establish your initial credit line of $200. A helpful feature with this card is the ability to select your monthly due date to fit into your paycheck schedule or otherwise fit your financial needs. Credit cards with high annual fees certainly aren't for everyone, but sometimes those high annual fees give you access to such impressive perks and rewards that, depending on your lifestyle, the annual fee might be more than worth it. This year we've added this "Editor's Choice" category to help you determine whether paying a few hundred dollars to carry a particular credit card just might open up a world of rewards and perks that make your life a bit more comfortable. *If a high annual fee isn't your thing, don't fret. Our "Best of 2019" list also features our picks for best no-annual-fee cards. Chase Sapphire Reserve® set the credit card industry buzzing in when it launched. The signup bonus alone is enough to make the $450 annual fee worth it for the first year: earn 50,000 points, worth up to $750 in travel, after spending $4,000 in three months. Beyond the annual fee, cardholders are also eligible for up to $300 in statement credit each account anniversary year as reimbursement for travel charges and enjoy complimentary access to more than 900 airport lounges around the world. When it comes to rewards, you earn three points per $1 on travel (after you earn your $300 travel charges statement credit each account anniversary year) and on dining and one point on all other purchases. Redeeming your points for travel through Chase Ultimate Rewards® makes those points worth 50 percent more (hence, the 50,00-point intro bonus is worth up to $750). Luxury credit cards with high annual fees aren't for everyone, but if you have the credit score to qualify and the funds to cover the annual fee, you could find that you quickly offset that fee with all the perks and features the card offers. A $550 annual fee card that offers lovely luxury perks, The Platinum Card® from American Express (American Express is a CardRatings advertiser; terms apply. See Rates and Fees) comes with complimentary airport lounge access, 24/7 concierge service and an annual airline fee reimbursement (with a pre-selected airline) of $200. New cardholders can also qualify for 60,000 bonus Membership Rewards® points after spending $5,000 in the first three months. One key difference here is that this card is a charge card, which means the balance must be paid off each billing cycle. You don't rack up interest charges with charge cards, but you also don't have the option of carrying over a balance if you need to. Methodology: CardRatings editors have been rating and reviewing credit cards for nearly 20 years. We bring that two decades of experience to our review process as we consider the rewards, rates, fees, perks and features of each card and how those things relate to each award category. Sometimes the categories and their criteria are straightforward as in, for example, the “Best 0 percent APR credit card.” In others we consider such features as the ease/flexibility of the rewards redemption process in addition to the earning of the rewards themselves. We’re constantly reviewing our list as credit card terms change often – if there’s a better card that rises to the top, we update our lists to reflect that change. Our goal is ensuring the consumer has the most up-to-date information so he/she can make the best possible credit card decision for their lifestyle and needs.